While many fathers may not want to be pampered like Mom, they still enjoy that thoughtful gift on Father’s Day, a token that you are thinking of them and appreciate all that he does. From morning to night, dad is busy working on something, fixing something, or just plain relaxing. This gift guide will help you decide which part of the day you would like to celebrate, make it a bit more enjoyable, all while supporting products made in the USA. Does your dad love music? Does he also love nature and being outside? This is the most clever shirt! I know my dad (a hard-core music lover) would really enjoy slipping into at the start of his day. Green Label Organic had me at their truly original nature-inspired t-shirts, but then I checked out their website and I was a goner. Totally hooked. They are a local business, family-owned and operated from the Blue Ridge Mountains of West Virginia. 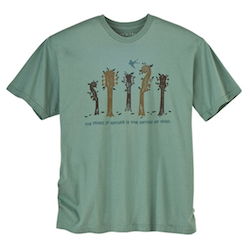 The music of nature is the nature of music.Their shirts are 100% Certified Organic super soft Ring Spun cotton and printed without the use of PVCs or other harsh chemicals. Wearing his organic t-shirt, your dad can get to work cleaning up his vehicle without releasing gross chemicals onto his skin or into the ground. EcoTouch is located in Dover, NH (my home state!) It began as a solution to water shortages, employing a clean and wipe technology using a variety of natural sources such as palm, coconut, corn and soybean. Your dad deserves a nice, relaxing rest after all his hard work and what would be better than a nap in a hammock? This durable, handwoven hammock is made from 100% post-consumer waste polyester Eco-Spun fiber in rural Virginia. The fiber is made mostly from recycled soft-drink bottles – each hammock uses 72 reycled plastic bottles! The wooden spreader bars are also eco-friendly and cut in the worker owned, high-efficiency mill and treated with natural oil for durability. At the end of the day, your dad can reward himself with a healthy, homemade grilled dinner cooked on the SPARQ Soapstone Griddle. My dad has this griddle and can attest that it is amazing. Cooks clean and saves energy. The soapstone is also non-stick which means it wipes clean, leaving no bacteria and residue. Cut out the dangerous carcinogens by putting a barrier in between the grill flame and your father’s food AND save energy as the stone absorbs heat and distributes it evenly which allows dad to turn off his grill while the food is still cooking. My dad has always enjoyed eating snack mixes and now he’s been ordered by his doctor to eat more protein so NatureBox is a perfect choice for him. I love NatureBox because it helps you eat healthier by focusing on snacks that are delicious AND wholesome. Do you know that the average American eats almost 25% of their calories from snacking? In fact, snacking is the leading cause of childhood obesity. NatureBox helps you get more out of your day without wasting calories on the bad stuff. A monthly service, NatureBox will deliver a different box each month that includes 15-20 servings of yummy, good-for-your daddy snacks. I had the pleasure of putting together one of these gorgeous puzzles handcrafted in Seattle, WA. It was challenging and fun like no other puzzle has ever been. If your dad prefers using his noggin’ for entertainment, this puzzle is perfect for him! Beautiful and intricately cut with lasers from eco-friendly pine, these Made-in-the-USA wooden puzzles will keep him busy for hours and he will thank you for it! Still haven’t found the perfect Father’s Day gift? 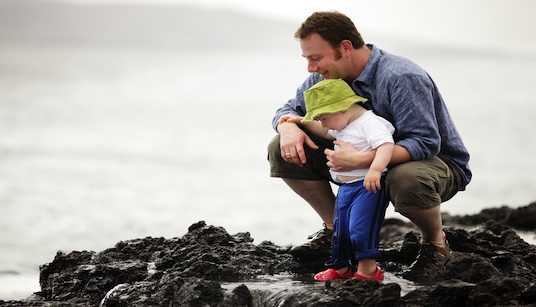 Check out HappyGreenMama.com for a more extensive list of Eco-Friendly Gift Ideas for Dad. Vicki is the editor of Happy Green Mama, a blog dedicated to natural living and whole foods. She's a mac girl who works in between wrangling three silly monkeys and chasing three equally-distruptive kitties.